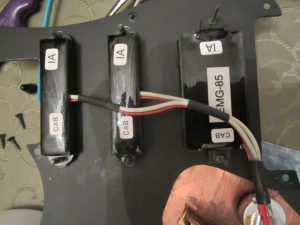 IF you have EMG pickups, they had a dating scheme in the 80’s and 90’s that was very easy to use. And it may help you in tracking down just when your guitar, or at least the pickups were made. It’s alpha code for the year of manufacture. Hopefully this may help in figuring out what year your guitar was made, or at least the pickups. And obviously anything without alpha codes is a way later model, not an Original Pre/Samick, Pre/Gibson, or it could be an original with “updated” pickups. I’d advise you to send pictures to Martin – he’s listed on the Contact Us page – he’s forgotten more about these guitars than I have learned. Hello, my valley arts have VA 0337 s/n on the back of the headstock. Seems to hv 2 EMG pickups with humbuckernon the bridge, single coil on the neck, and nothing in the middle. Gold hardware with floyd rose trem. Can u pls help identify the guitar type and year? You’ll need to send pictures to Martin…he’s the expert on identification. You can find his info on the Contact page.